Protecting the public purse was a major electioneering message for then candidate Akufo-Addo and his team, and Dr Bawumia commended the Auditor-General and his staff, whose decision to undertake a special audit into the liabilities of the Ministries, Departments and Agencies led to the disallowance of payments totalling GHC5.4billion to ‘ghost’ companies, a major saving to the public purse. “This is a testimony that the Audit Service is committing itself to protect the public purse. “I urge the Auditor-General to sustain this exercise in order to instill discipline in public financial management at all levels of government, and to deter public officers who might be contemplating to dupe the State using their unpatriotic practices. 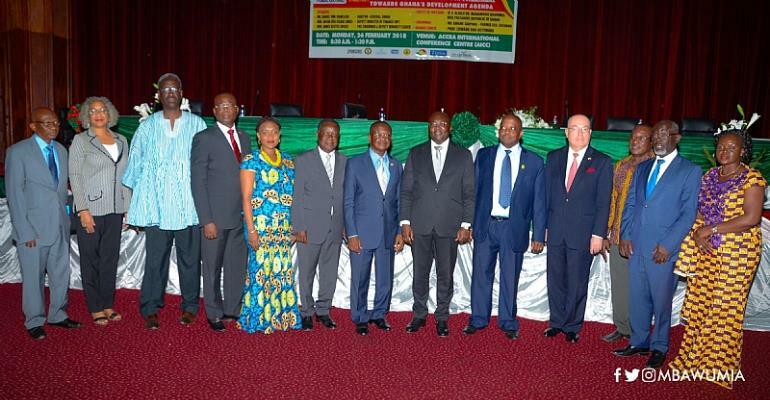 Other speakers at the event included the US Ambassador, H.E Robert P. Jackson, the Chairman of the Board of the Audit Service Prof Edward Dua Agyemang, and the Auditor General, Mr Paul Yaw Domelevo. A number of former Auditors-General including Mr Osei Tutu Prempeh, Prof Dua Agyemang and Mr Richard Quartey were honoured at the event.